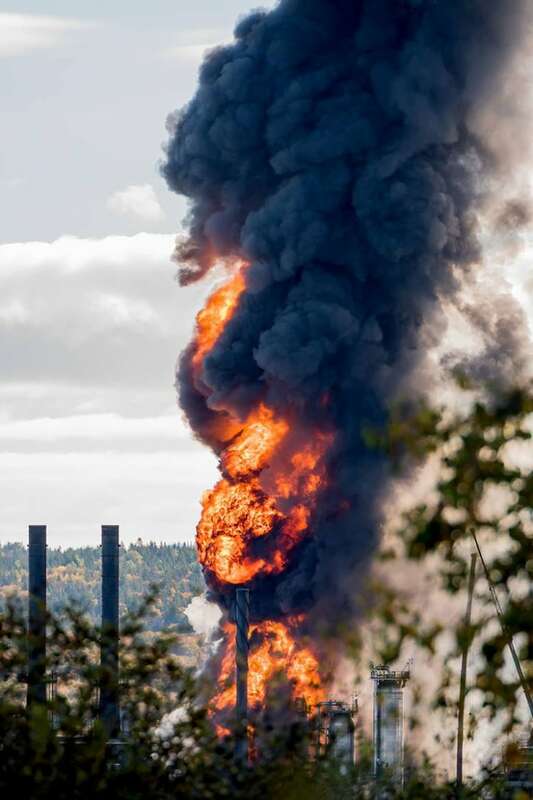 The number of workers injured in the explosion and fire at the Irving Oil refinery in Saint John on Monday is higher than the four initially reported. Family doctor Mike Simon says he treated five workers that day alone, including two who were thrown by the blast. He expected to see at least six more injured by the explosion or fallout by the end of the day Wednesday. And there could be many more with psychological scars, Simon said. “It’s almost like you’re being in a war zone, right? Because suddenly, the explosion, a lot of guys are running for their life. Irving Oil and Saint John Emergency Measures Organization officials have said four workers were treated at the Saint John Regional Hospital for minor injuries after the 10:15 a.m. blast that sent flames shooting an estimated 30 metres high and left a plume of black smoke billowing over the city’s east side for hours. The Horizon Health Network has said the hospital treated five people for non-life-threatening injuries that day, but declined to elaborate, citing patient confidentiality. Eric Brideau, who visiting the site Tuesday and met with employees, said he could not confirm the total number of workers injured. The cause of the explosion has not yet been determined, but officials believe it stemmed from a malfunction in the unit that removes sulphur from diesel. Brideau described the investigation as “technical and complex.” He expects it will take two to three months to complete. The Irving Oil refinery is the largest in Canada. It employs about 1,400 people and is capable of producing more than 320,000 barrels per day at the sprawling site, which covers more than 300 hectares. Close to 3,000 people were working at the time of the holiday Thanksgiving explosion because of a massive turnaround maintenance project that’s underway. About 100 of them were the normal operations crew, while the rest were contracted tradespeople from across New Brunswick and other provinces. Simon, who’s the go-to doctor for some of the contractor companies, says they called him about an hour after the fiery explosion, asking him to open his office in the city’s north end for incoming patients. “There was a fellow [who] hurt his ear because the blast sort of hit him on the side. There was a guy who was blown off a ladder and twisted his ankle. “There was a guy, who again, was blown off his desk, and fell into a railing and he had some contusions, injuries on his arm. Simon said treating less serious injuries at his office helped free up the emergency room to deal with anything more serious that came up and saved the workers from facing long waits. The Saint John Regional Hospital went into “code orange” after the explosion was reported, meaning it was prepared for a possible mass casualties influx. “They plan for these events well in advance” and run mock drills, said Simon, who has worked in the emergency room over the years. There are protocols about calling in extra doctors and nurses, if necessary, as well as administrative and janitorial staff, and surgical specialists would be on-call, he said. Trauma rooms would be prepped, patients discharged to clear beds, and medications readily available. Simon said it could take a few days for workers to even realize they’re injured after such a traumatic incident. He encourages the affected workers to seek counselling or at least find someone they can talk to as they work their way through any issues.